This entry was posted in Books by lisaalzo. Bookmark the permalink. I love this book. It was interesting to see the changes with each generations, but what I loved most was the “feel” of the book. My paternal line is 100% Slovak, with me being the 2nd generation born in USA. 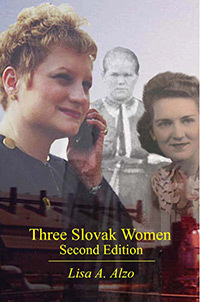 Unfortunately, I did not learn of my Slovak heritage until I decided to do the first Family History on us. By then, with the exception of one uncle, all the prior generations were gone. The uncle was the ‘baby’ of family, so he was more ‘Americanized’ and could not remember a lot of the old traditions. I have no recipes, no family stories, no Slovak traditions passed down to me. I feel like a Slovak orphan in a sense. Your book put me in touch with my culture and my ancestral roots far more than any census record or vital stat ever could. I am very grateful and truly feel a better connection to my family because of this. Thank you.